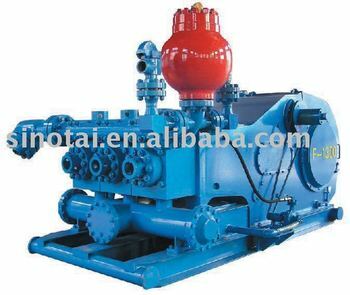 F series mud pump is applicable to the requirement of high pump pressure in oil field and high displacement technology of well drilling with its solid and compact structure, small volume and outstanding operation performance. F series mud pump has long stroke maintaining operation at lower frequency resulting in enhancing the performance of giving water effectively and prolonging the lifetime of the consumable hydrokinetic parts. The air-suction kit is advanced in structure and reliable at operation to reach the optimized absorbing target of air suction into linepipe. F series pump powering side adopts the combined lubrication featured with reliable lubrication and adding the operation lifetime of powering part. The series pump is widely used in oil field and other lines of industrial and mining enterprise, operation of drilling well and well repairing etc F-1300 mainly with adapted drilling machine32-45. The series pump is produced strictly according to API Spec 7K “the equipment specification of well Drilling and Repairing”, and performanced the EX-Work test under the specification thereof.